Hundreds of jobs have been safeguarded by the announcement that the lifetime of Hunterston B nuclear power station has been extended by five years. British Energy said the site in North Ayrshire would continue operating until at least 2016. Hunterston employs about 670 staff and brings in an estimated £55m a year to the local economy. 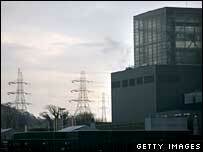 However, anti-nuclear campaigners branded the plant "unreliable" and said it should close. British Energy also announced that the operation of Hinkley Point B, near Bridgwater, Somerset, was also being extended. Technical and economic evaluations were carried out to ensure the plants were viable over the next few years. Tom Ungi, station director, said: "This is great news for all of us at Hunterston B and for everyone in the local North Ayrshire community. "The decision means we can continue to provide highly-skilled jobs and bring major investment to the area. "It also shows that British Energy recognises the professionalism and commitment of our staff in safely supplying low carbon electricity for more than 30 years." Hunterston B generates sufficient electricity to supply almost half the households in Scotland. British Energy said that during its working life the station had saved about 140 million tonnes of CO2 from entering the atmosphere. This is equivalent to the entire population of Edinburgh reducing its carbon emissions to almost zero. Energy Minister Jim Mather, said: "The present government is not opposed to existing nuclear power until the end of its natural life but Scotland doesn't need or want new nuclear power stations. "The fact here is that this decision would mean that the company would have to invest significantly more at Hunterston to ensure it remains safe and reliable. "That has to be in Scotland's interest." David Cairns, minister of state at the Scotland Office, said the announcement underlined the vital role of nuclear power. "The challenge the Scottish Executive now faces is explaining exactly how we keep the lights on in the future without this reliable, low-carbon energy source," he added. Amicus representative Stuart McGhie said staff were delighted with the news. "This life extension is a major bonus for the station," he said. "It's the result of a tremendous amount of hard work by everyone involved, both on and off site, to secure a further five years of safe, reliable generation - an achievement of which we are all very proud." However, Scottish Green Party MSP Patrick Harvie said the station was already "past its sell-by date". He added: "Spending millions more to patch up decrepit nuclear power stations is just throwing good money after bad, and we're surprised that ministers can't see that. "Nuclear power remains dangerous, unsustainable, and uneconomic. This decision means more money spent on yesterday's technology instead of renewables, and will add even more nuclear waste to what we've created already."